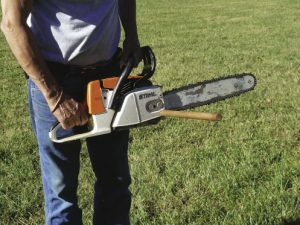 There are only two economical, exciting, expeditious, and fun methods of cutting firewood: one is with a chainsaw, the other is … we’ll get to that later. 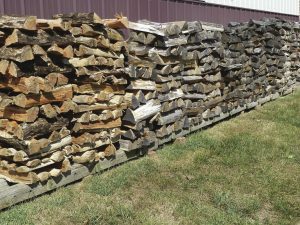 I’ve picked up a bunch of tips by reading Popular Mechanics since I began sawing and splitting my own firewood over 50 years ago. Along the way, I’ve created and developed a few of my own tricks, methods, and means which I am pleased to share with fellow self-reliant types. 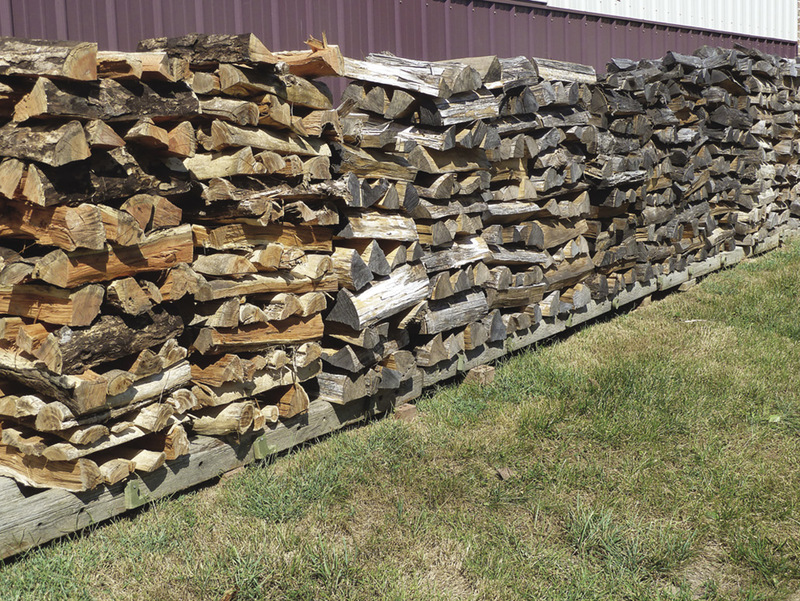 Debarked firewood stacked crisscross style will retain the ambient moisture level whereas stacked in the traditional cordwood manner causes the interior of the logs to remain damp. The wood shown here on the south side of the barn will last for over a year without decomposing. Note the letter markers under the stacks. Once you’ve decided the length of the firewood pieces that best fits your fireplace, cut a segment of 1-inch dowel to that dimension. Be sure to measure from the chain to where you want to cut the dowel. Use a #3 drill bit to make a hole in the end of the dowel. Thread the hole with a ¼-28 tap. Next drill a small hole on the side of the dowel about 1 inch from the end of the tapped hole. 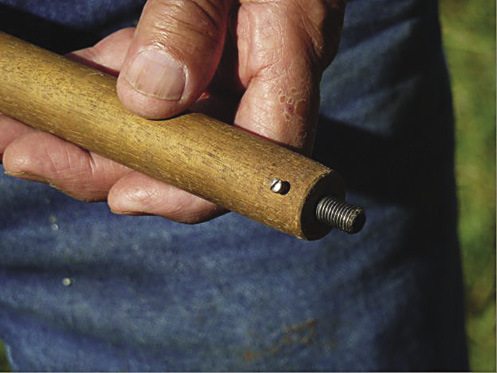 Tap this hole for a #6 or #8 machine screw (you can also use a small wood or sheet metal screw). Using a bolt with at least 2 inches of ¼-28 thread, cut the head off leaving just a threaded piece. Screw one end of this piece into the dowel. Then screw in the #6 or #8 machine screw to hold the ¼-28 piece in place. On the right side of your chain saw remove the chain guard and drill and tap a ¼-28 hole. Many chain saws have a predrilled hole on this piece. Note: you can use a ¼-20 or even a 5/16 NC (National Coarse) or NF (National Fine) if that’s all you have, but National Fine threads give better purchase in the thin aluminum chain guard. Firewood length tool is best located close to the bottom of the saw. This photo shows each notch to be exactly 15 inches apart, the length I find best for my WBFP. The cut wood in the background has been debarked and is ready to be split. Hey, this is easy if you have the right tools … if you don’t, you have an incentive and an excuse to buy them. Some woodcutters have espoused laying the saw alongside the log and using the length of the saw blade as a rough measure. Not a good plan with a running saw in the woods. It’s not only inaccurate, but could be dangerous inasmuch as it necessitates convoluted positioning and/or stepping on or over the log for each measurement. Now you’re ready to index your log by making small cuts the same distance as the dowel. After making the cuts, remove the dowel and cut the logs at each mark. 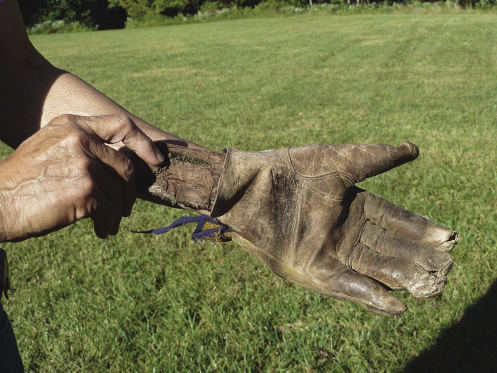 Don’t try completing the cut with the tool attached — something will break. The fun part is cutting wood with a sharp chainsaw. Use a machete to debark your firewood as shown in the photo. Bark is there to protect trees from fire, excess moisture, and bugs while the tree is still alive. Once you’ve cut it, the bark becomes a trap for moisture and thus a haven for creepy-crawlies and decomposition. 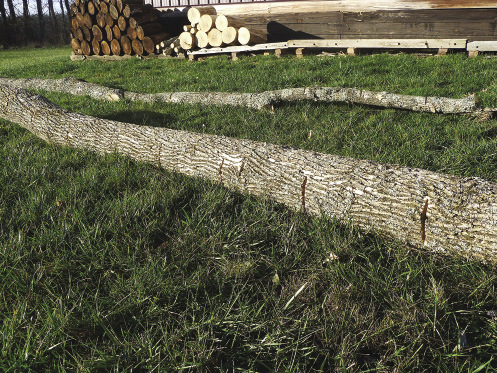 A debarked and split log, properly stacked, can last a number of years and will be insect-free when you bring it into your home. Some woods strip easier than others. I find it best to cut and strip a few logs at a time. Certain barks have unique attributes, such as Shagbark Hickory; the outer bark is great for making tea while the inner bark is unsurpassed for smoking foods. Some woods strip easier than others. I find it best to cut and strip a few logs at a time. Certain barks have unique attributes, such as Shagbark Hickory. The outer bark is great for making tea while the inner bark is unsurpassed for smoking foods. When using a machete for debarking, a piece of bark slipped between your hand and glove will make the task comfortable on the palm. 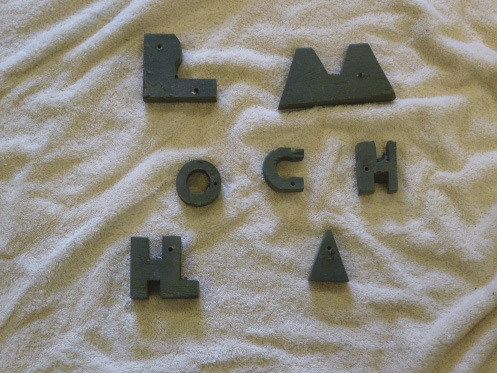 Using a small hand saw, jigsaw, or band saw, cut letters to represent the type of wood you will be stacking, e.g., BL for Black Locust; W for Walnut (Upside down it’s an M for maple), O for Oak, etc. Drill a clearance hole for a suitable length deck screw and mount the symbol on or under a stack of the appropriate wood. 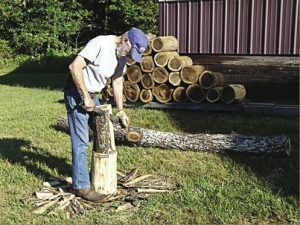 The trick to splitting firewood by using a sledge hammer and wedge is to pick a small spot on the wedge top, then look, intently, at that speck all the while you’re swinging the sledge. If you take your eyes off the target or lose focus, you’ll miss. Misses do happen and for that eventuality tape a piece of angle iron to the handle adjacent to the head. That way, you won’t damage the handle when it slams into the wedge. 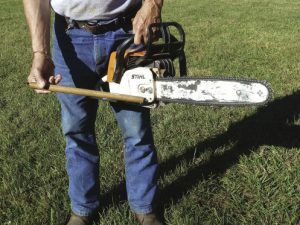 Use the same techniques and tricks when swinging an axe or splitting maul. Oh yeah, about that other economical, exciting, expeditious, and fun method of cutting firewood … I made that part up. Nothing beats a chainsaw.